Welcome to the site for monitoring of the existing HPP / sHPP in Bulgaria. In recent years, the construction of hydroelectric power plants in Bulgaria has undergone a rapid development. Renewable energy sources are a priority of the energy policy not only in Bulgaria but throughout the European Union as well. The production of energy utilizing the power of the water brings undoubted benefits for the whole country, because it creates a gross domestic product that does not require import of resources, increases energy independence, etc. No one can be against the use of rivers for such purposes, as long as the energy production complies with the environmental standards which guarantee the environmental objectives set to save the life in, along and around the rivers. 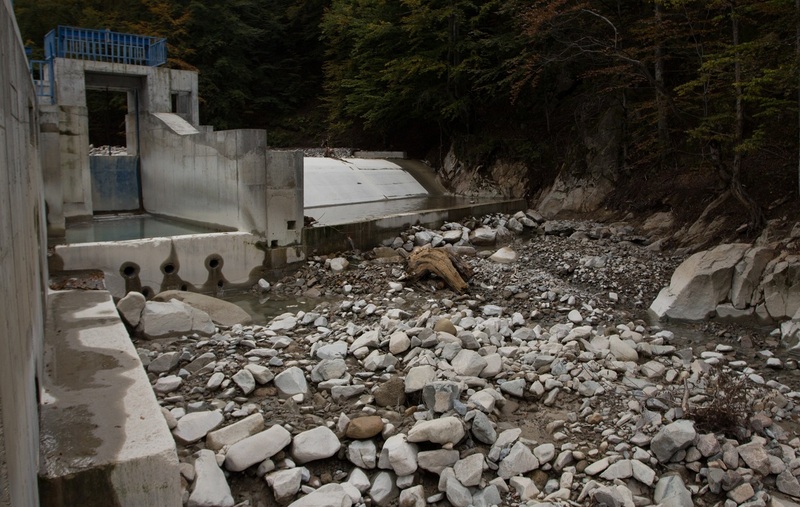 What is the hydropower sad reality in Bulgaria? To release into the river a guaranteed minimum water flow below the intake - to secure the ecosystems' survival in and around the river. To provide options for fish and other aquatic species migration through appropriate fish passages - again for reproduction and survival. To remove and clean the silt accumulated in the ponds and not to discharge it abruptly into the rivers - a major problem for the run-off river and low-head power plants. Some rivers are literally dried up after the water catchments of the derivation type of power plants. This is because the enture river is diverted in the pipelines to produce more electricity and not a single drop of water is running in the riverbed between the catchment and the power house. Usually the distance between the two is several kilometers. In the prevailing number of cases the derivation hydro-power plants release such a small quantity of water only to feed a few puddles in the river without any running water in between. Abrupt silt discharge from the lakes of the run-of-river plants - this leads to mass killing of fish and other species - like it happened with HPP Lakatnik in 2008, as well as with the Luna HPP in 2016. No fish can pass through the fish passes (with a very few exceptions). There are fish ladders impassible for animals with legs or mountain climbers. There are even plants which do not have and fish pass of any kind. In recent years, separate people or organizations have sent many signals for such problems to the Ministry of the Environment and Waters and / or to the River Basin Directorates. In some cases, after the inspections, small fines were imposed on the owners (less than the daily profit of a HPP). Mandatory prescriptions have also been given to some of them, which are not followed, simply because there isn't any subsequent control. In some cases there is no reaction from the Min Env and the Basin Directorates at all. In any case - with or without the prescriptions - the situation remains unchanged during our next visits! For every violation of the environmental rules we do our best to fight it, since the authorities do not care at all. 1. How a particular HPP was operating? 2. What has been done in order to eliminate the violations? 3. How does it work now? In this way, the information gathered becomes accessible to the public, to the media and to the controlling authorities at national and European level. An equally important goal is to show the good examples where all the requirements are met. Thus we can prove that the production of hydroelectricity is possible without a breach of the legislation. All investors which follow the rules are among the most interested parties in forcing all the rest investors to follow the regulations too. The sooner they realize it the better. Unfortunately only a few of them have come to such an understanding. BUT, as long as most of the HPPs/more than 90%/are operating in a way which violently destroys the rivers, we will do our best this sad reality to change. Important for the English users: Please note that the individual status for a visit at a given HPP water catchment holds a description that is still not translated. We apologize for that, but hope that the pictures and the videos are clear enough and speak for themselves. Cave Club "Silivryak - Trigrad"